This cake taste great and is recommended for all holidays. 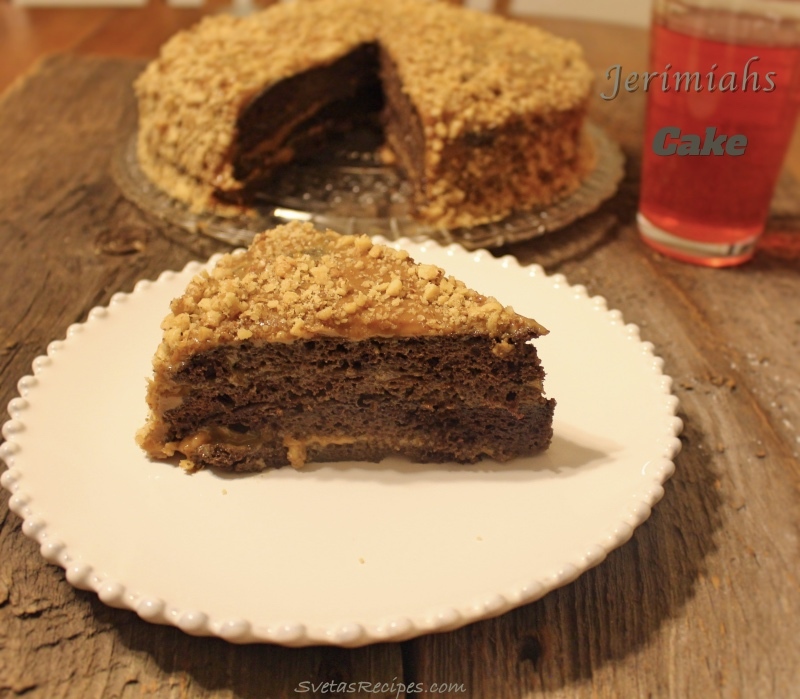 It is a chocolate 4 layered cake with a yummy and creamy filling! 1.) 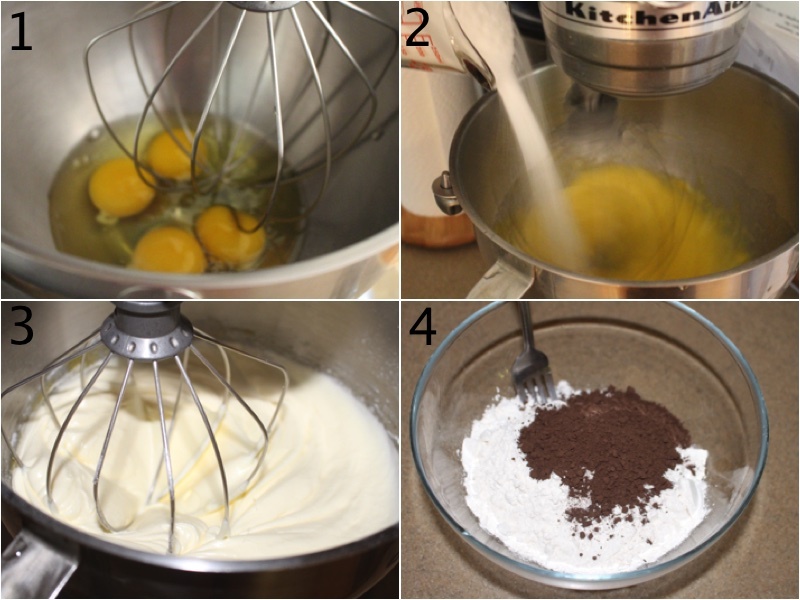 In a mixing bowl add 4 eggs and turn on the mixer. While it is mixing gradually add sugar. Mix for around 15 minutes. In a medium size bowl combine your sifted flour with cocoa powder. 2.) 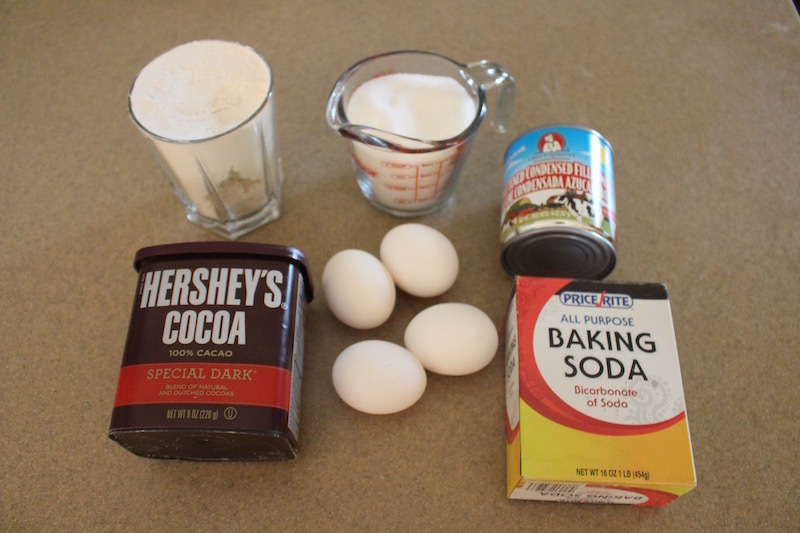 In a small bowl combine you’re baking soda and vinegar. Add your vinegar mixture and condensed milk into your egg mixture and combine well. Next add your cocoa mixture to your egg mixture and mix well. Using a cake cooking form with tin foil add split your cake mixture evenly into 2 of the forms. Bake for 30 minutes on 350F. 3.) After the cake layers have cooled off cut them both into 1/2’s. (4 layers in total) In a small bowl add cooked condensed milk, butter and mix together well. Place your walnuts onto a cookie sheet and bake for 10 minutes on 350F. Next crush your walnuts with a rolling pin. 4.) Using a condiment container spray apple juice on each layer of the cake. 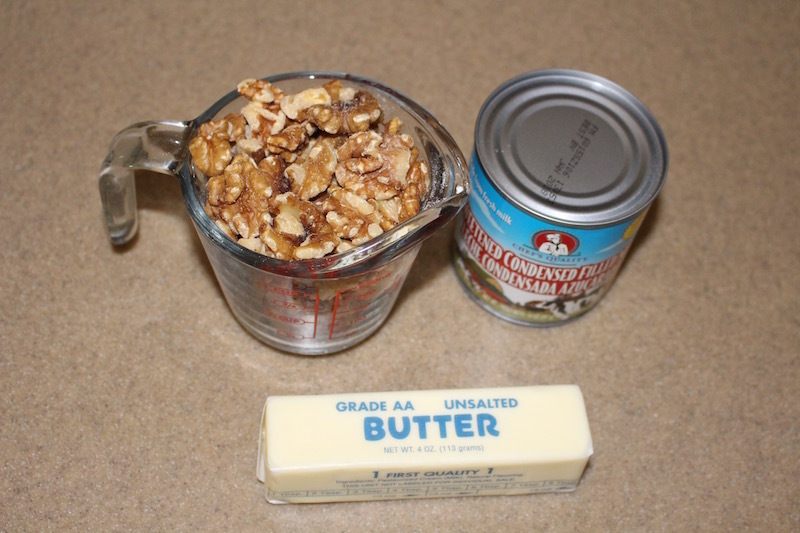 After on each cake layer spread you’re filling and your walnuts. 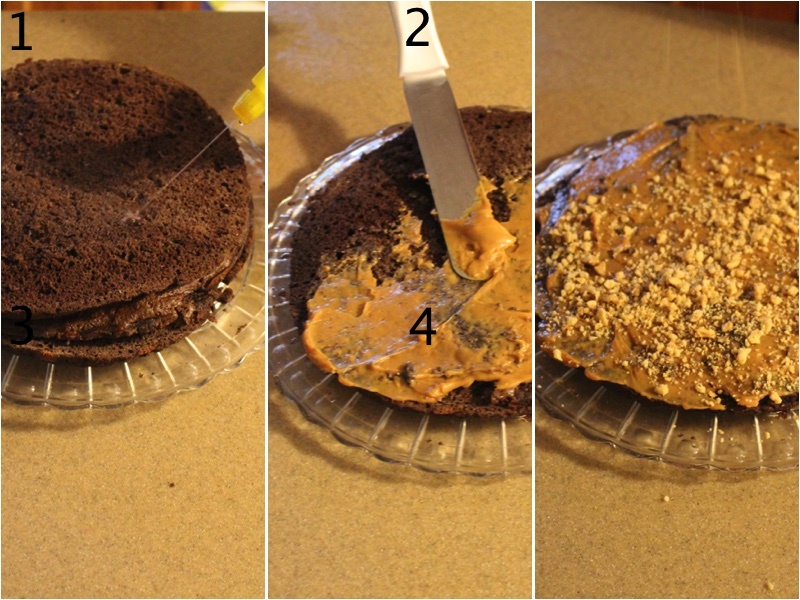 Do these steps for all 4 layers and also add filling to the top and sides of your cake. If your would like you can also spread walnuts on all sides. Next place on a serving dish and enjoy! In a mixing bowl add 4 eggs and turn on the mixer. While it is mixing gradually add sugar. Mix for around 15 minutes. In a medium size bowl combine your sifted flour with cocoa powder. In a small bowl combine you're baking soda and vinegar. Add your vinegar mixture and condensed milk into your egg mixture and combine well. Next add your cocoa mixture to your egg mixture and mix well. 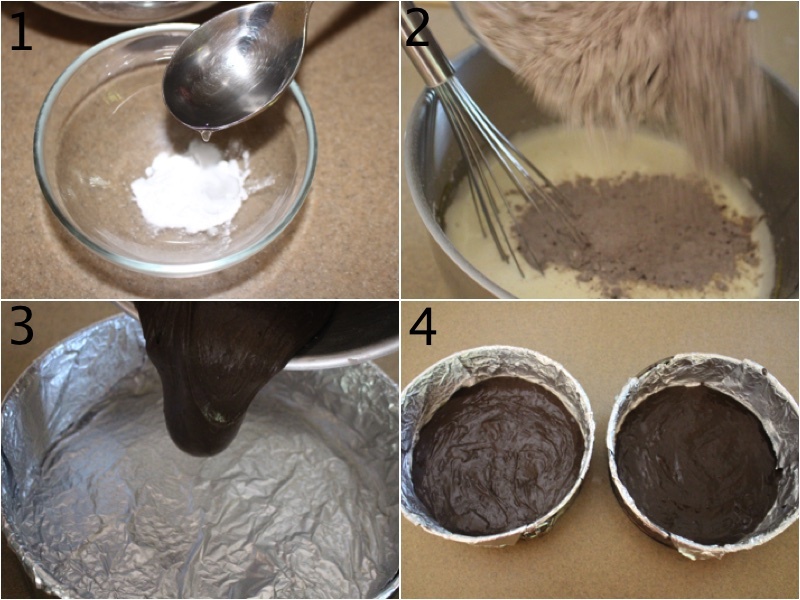 Using a cake cooking form with tin foil add split your cake mixture evenly into 2 of the forms. Bake for 30 minutes on 350F. After the cake layers have cooled off cut them both into ½'s. (4 layers in total) In a small bowl add cooked condensed milk, butter and mix together well. Place your walnuts onto a cookie sheet and bake for 10 minutes on 350F. Next crush your walnuts with a rolling pin. Using a condiment container spray apple juice on each layer of the cake. 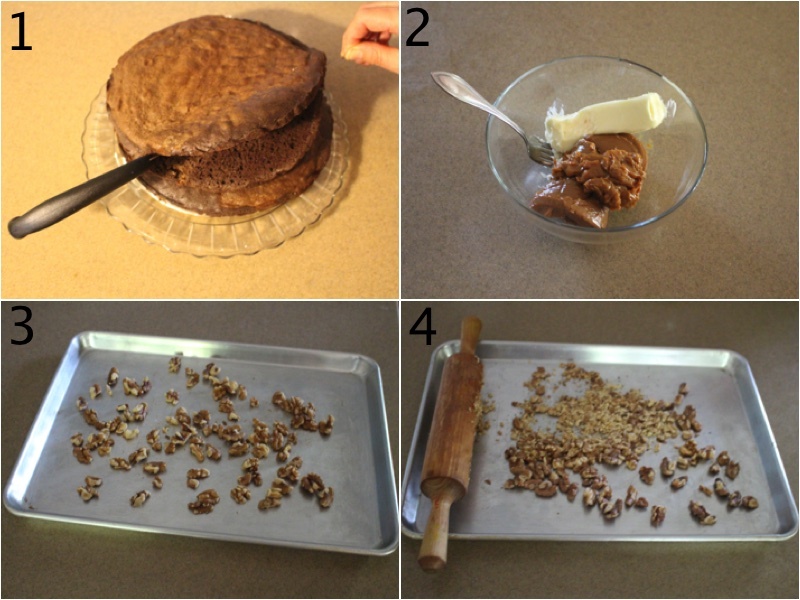 After on each cake layer spread you're filling and your walnuts. Do these steps for all 4 layers and also add filling to the top and sides of your cake. If your would like you can also spread walnuts on all sides. Next place on a serving dish and enjoy! I don’t see apple juice on your ingredient list. How much do you need of it? Can you use a spoon to soak he cake layers or you need a spray bottle? Your welcome, I also enjoyed that cake.